Coordinating Gym Wear - The Cornerstone for Thoughts! The gym is probably the last place you would even think about being fashionable. Why? Possibly because none of us want to look our best at any stage of arriving or leaving a gym because we’re going to feel our worst whilst in the clothing. Yet I feel that if I am wearing some clothing that I feel great in the chances of a better workout immediately increase. Today I wanted to show you my favourite coordinating set from USA PRO. I love USA PRO UK for two reasons. 1) Their range of styles and fit of clothes is great. I love how you can go plain and simple with navy and black shades or go crazy and wild like I tend to go for. 2) The price. USA PRO being sold at Sports Direct means that the price of the items tends not to be too expensive which is great. Often with sports wear you end up spending over the odds despite telling yourself it was worth the expenditure. With this all in mind it is no wonder why I tend to always pop into the retailer for when I need my active wear re-vamped. I’ve always found the leggings and sports bras to be of great quality. I love how the leggings fit great and always make you booty look just as good as Beyonce’s. The sports bras are great also. This I find surprising because the tops are done in clothing sizes rather than actual bra sizes. This is fine actually which has surprised me simply because I find that when swimwear does this they are always too small. However for sports bras this works great because opting for your normal top size for the top means you babylons are supported and will not move. You might not pull during your combat, spin or aerobics class but you boobies will remain still for the duration of the workout. This particular combo I felt was just perfect for the Spring and Summer time because of the funky floral print. Bright colourful prints are perfect for this time of year and combine the warmer climates with the gym wear. The vibrancy is also so different to my usual black and navy wardrobe. 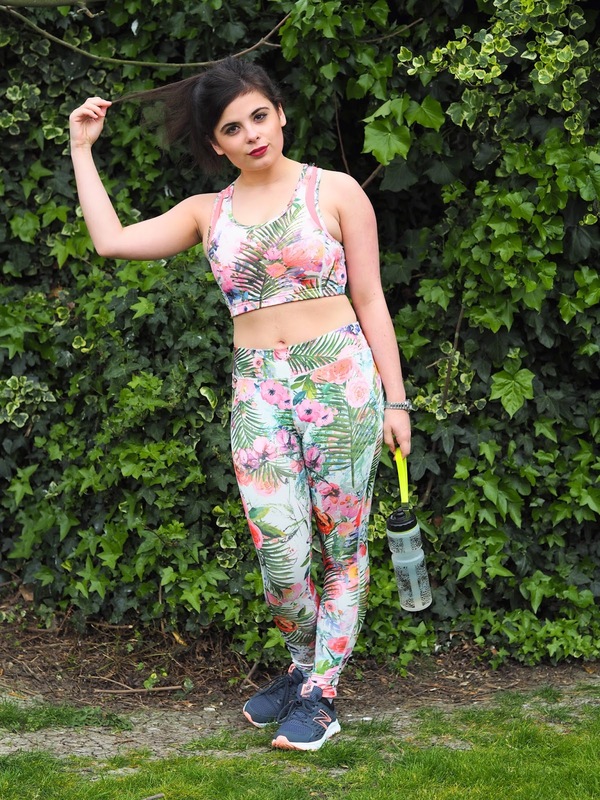 Do you find yourself wearing more vibrant and colourful clothing for the gym than for leisure? This often is the case for my wardrobe. I don’t usually coordinate my active wear but when I have I feel like sassy and ready to attack those calories. Perhaps feeling confident in your active wear is the first step to working hard and developing a true relationship with the gym world.